Speaking Opportunities. If you are interested in Ezrah Aharone speaking at your next event or Forum, we would like to hear from you! Born and raised in New Jersey, Ezrah Aharone is a 1980 graduate of Hampton University. 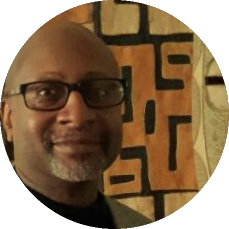 He is a professor of political science at Delaware State University (DSU), a scholar of sovereign studies, and author of 3 political books whose syndicated op‐eds and opinion pieces have appeared worldwide in over 200 publications, including The New York Times. 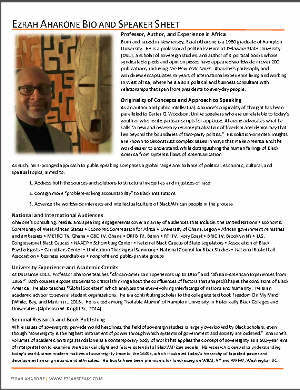 Aharone’s philosophy and worldview encapsulates 35 years of international experience living and working in West Africa, where he is also a political and business consultant with relationships that span from presidents to everyday people. His solution‐oriented insights are known to deconstruct complex issues in ways that make America and the world easier to understand, while distinguishing the human failings of Black America from systemic flaws of Americanization. Contact Ezrah: Send your questions and comments; include your name, your interest, a short message and the best way for Ezrah to get in touch.